Anette Olzon is best known to many people as the former singer of Nightwish. She was originally the singer for Alyson avenue, before joining Nightwish after their acrimonious split with their singer Tarja Turunen. Although many fans gave her a hard time as her vocal style is very different from the classical Soprano vocals of Tarja, she did sing on the band's most successful albums, "Dark Passion Play" and "Imaginaerum", and particularly on the latter put in a superb vocal performance. 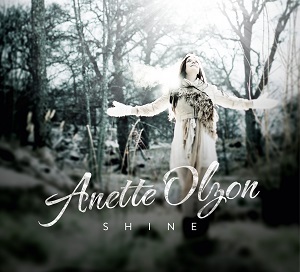 Since being fired by Nightwish, she has been working on her first solo album, Shine. She actually started work on the album in 2009 when she had planned to release it during the long gap between Nightwish albums (as singer she wasn't involved in the writing process so had time to write her own songs). Since leaving Nightwish she's written more and worked with other songwriters to create this album. The first thing that struck me listening to the album is how good her voice sounds. In an interview for Planetmosh ( http://planetmosh.com/anette-olzon-interview-february-2014/ ) she explained that in Nightwish she was given the song's in a certain key and had to adapt her voice to the songs, whereas writing her own material allowed her to write the songs to fit her range. If you haven't heard anything from the album yet then I recommend you check out the video she has released for "Lies". It's a great song and is a good indication of what you can expect from the album. While some people reading the lyrics might assume it's about the split with Nightwish, it's actually a divorce song. The album opens with "Like a show inside my head". Like the rest of the album it's a rock song, although some may choose to call it "pop rock". There's plenty of orchestration too that adds a lot of richness to the music - string instruments such as violins and cello really do give a lot of extra depth to the music. Next up is the title track, Shine. It's another great song and has a strong uplifting chorus. One of my favourite songs on the album is the hauntingly beautiful "Watching me from afar". It's a beautiful love song performed very simply - excellent vocals backed by piano and drums. This is an excellent album. There's a mix of the melancholy and the positive in the lyrics, Anette's voice sounds fantastic, and the music is excellent. It's certainly not another Nightwish album, but that's good - what we have here is something that is very different but I can still see many Nightwish fans enjoying this album, while others pine for the days of operatic vocals. Fans of female fronted rock and metal are really spoilt for choice this year. We've already had the new album from Within Temptation, and have albums from Delain, Epica, Lacuna Coil, Arkona, Diabulus in Musica, Skeptical minds and many more all coming out in the next few months, so Anette's album is up against some tough competition, but as someone who has spent the last couple of weeks listening to this several times a day, every day, I can say this is an album that I highly recommend - definitely well worth a listen. "Shine" will be released on 31st March 2014 via earMUSIC.